Young adults head off to college hoping they’ll learn enough in the classroom to get their degree, and enough about life to make their way in the world once they graduate. But firsthand knowledge of identity theft is one lesson they don’t want to learn. Always keep your dorm room or apartment door locked, even when you’re home. Most identity theft still occurs in mundane, nontechnical ways, like a wallet being stolen from a drawer or a purse taken from an unlocked room. Be careful with documents that contain personal information. Shred bills, and keep credit card and bank account statements stored in a safe, locked location. Leave your Social Security card and birth certificate at home, with your parents. You’ll need your SSN constantly in college, so you should have the number memorized. Be careful about how you use it and who you give it to; they should have a legitimate need for it. Only carry with you the ID that you actually need, like your driver’s license and student ID card. Never loan those items to a friend, no matter how close you think you are. Be wary about who you allow in your room. Remember, anyone who enters your living space could gain access to your personal information. Be careful what you share on social media. Never expose personal information such as your date of birth, home address, phone number and unique information like your mother’s maiden name which is often used for authentication. When making online purchases, only do business with websites that have the security lock symbol. The symbol indicates the website has taken measures to protect customers’ information. Never complete a credit card application at a table or booth on campus. Instead, go through the credit card company’s secure website or contact your bank before you go to school. Monitor your accounts and credit report regularly. Not only will regular monitoring help you identify possible occurrences of identity theft, it can help you better understand how the financial decisions you make affect your credit score. With some preventative steps and prudent caution, college students can ensure identity theft is one thing they don’t learn about the hard way. Did you know that college students are five times more likely to be a victim of identity theft than just about anyone else? In fact, an FTC study showed that people in their twenties log the most identity theft complaints. It’s not that thieves are targeting students; think of campus identity theft as a crime of circumstance. Close quarters plus lax security across student devices means virtual pickpockets have it easy. And where once a thief took a gamble when snagging a smartphone for this kind of info pilfering, innovations like the quad core processor and mobile network advances have made every student’s phone a hot repository for sensitive information. Data that all too often exists unprotected on student smartphones. Not downloading any security software is one thing, not even using the built-in password protection is another – but many college students are guilty of both. That’s what makes California’s new smartphone kill switch law so important. Right now, most smartphones can’t be remotely locked or wiped if they’re stolen unless the owner has downloaded third party security software. There are plenty of apps on the market and yet up until just recently very few devices came with anti-theft features enabled or even standard. But when the new law takes effect, all smartphones sold within California’s borders as of July 2015 will have to ship with the ability to render the device unusable in the event of theft – either with a hardware or software solution. More importantly, the built-in kill switch will be opt-out instead of opt-in and the lockout will be reversible. That’s especially good news for students using phones as auxiliary data storage and their apps as study tools. If you’re thinking that the new law won’t impact your risk of identity theft, think again! The passage of the California law is making waves across the nation. Some manufacturers have already started adding software-based switches on devices, and officials in other states and even other countries have argued for new laws mandating kill switches. That’s not all that surprising when you consider that the original law received widespread support from law enforcement agencies and prosecutors who believed it would reduce smartphone thefts. And they’re probably right. After Apple added a kill switch to its devices in 2013, iPhone theft dropped dramatically in New York, San Francisco and London. Samsung devices can also be remotely bricked. Now Qualcomm, maker of the Snapdragon processor, is releasing a hardware-based security solution called Safeswitch that allows remote locking with full reversal if the device is recovered. This may all seem, well, academic to students who don’t have much in the way of credit or funds. But as today’s student is using their phone to pay bills, settle up at the checkout, access bank accounts and university information, and for nearly all communication, tomorrow’s identity thief is planning their next move. Giving thieves instant access to all your personal data is as easy as leaving your phone unlocked on a café table while you walk to the counter for a refresh. And the information they take from you can damage your credit and finances not only in the short term but for years after the theft takes place. So don’t wait for the law to take effect if you’re in California or for a similar law to be passed in your state. A little googling is all it takes to find solid security software (which may even be free) that can give you essential protection for your phone or tablet, as well as more than a little peace of mind. Families that are paying for college are facing one of life’s biggest expenses. To make college affordable, students often search for scholarships to help themselves pay for school. Unfortunately, although many legitimate and generous scholarship opportunities exist, there are also scammers that prey on vulnerable students and their families. Online financial scams are getting more and more common. In fact, people who earn a Certificate in Financial Crime Investigation often spend their careers rooting out online fraud. To read more about using due diligence before paying someone who approaches you over the Internet, visit this page. Then, before you commit to a school, familiarize yourself with some of the most common scholarship and financial aid scams. If you get a direct mail or email invitation to a free scholarship seminar, you’re usually better off staying at home. When you show up to the seminar, you’re more likely to hear about annuities, insurance and other investment products than scholarships. Presenters might also ask for money to enroll you in a scholarship matching service, or they might offer student loans with exorbitant fees and interest rates. Always verify the identity of the company that’s hosting the event. If the company doesn’t list a legitimate phone number, it’s a scam. Scholarships are competitive, and there are usually many qualified applicants. No scholarship has to try to recruit students via email. If you receive an email saying that you’ve been pre-qualified for a scholarship, delete it immediately, and never click on any of the links. Also, beware of pop-up windows that say, “Congratulations! You’ve just won a $10,000 scholarship!” Be especially cautious if you’re told that scholarships are available on a first-come-first-served basis. Legitimate scholarships don’t ask for a fee when you apply, and neither do legitimate financial aid offers. If you’re asked to provide a credit card number or bank account number to hold your scholarship, never provide the information. Most scholarships are paid directly to the university, not to the student. Even if the disclosure statement offers a money-back guarantee, never ever pay a fee to hold a scholarship or student loan. 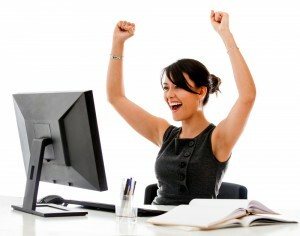 Some companies offer to help you apply for grants, work-study, loans and other kinds of aid. They say that they’ll fill out your paperwork for a “nominal upfront fee.” The only way to get federal student loan funds is to fill out a FAFSA, and you never have to pay to submit your FAFSA. Also, don’t be duped by testimonials praising the company’s amazing service. Most of the time, companies pay for these testimonies, or they make them up entirely. The scams described here are just some examples of potential scenarios. Fraudsters are dreaming up new kinds of scams all of the time. However, by recognizing some of these additional warning signs, you can steer clear of almost any scholarship or financial aid scam. “You won’t find this information anywhere else.” Legitimate scholarship programs are transparent about what they offer, and they’re eager to give away their funds. If someone promises special insider scholarship information, then it’s probably a scam. “You’re a finalist — even though you never entered the contest.” Scholarships have a competitive application process. People who award scholarships probably aren’t going to cold call you or send you an unsolicited email. “You get a scholarship, or you get your money back.” Some legitimate services do enter your name and qualifications into a database and match you with available scholarships for a fee. However, no legitimate service guarantees that you’ll win a scholarship or get your money returned to you. “This offer won’t last long.” Most scholarship applications have strict deadlines, but you’re not going to be pushed to apply. If a salesperson is pressuring you for money for a limited-time opportunity, then the salesperson is probably shady. What If You’ve Been Scammed? If you’ve been victimized by a scholarship or financial aid scam, file a complaint with the Federal Trade Commission, and contact your state attorney general’s office. You might feel embarrassed to admit that you’ve become a victim, but your report might help someone else to avoid the same fate. College! Kiss parental rules goodbye! You make your own decisions, set your own schedule and basically live the life you’ve been dreaming about. Sadly, there are people out there just waiting for you to be so carefree. As you’ll soon discover, college, though abounding in fun and exciting new experiences, can be quite expensive. When the need for multiple jobs hits and you’re still wanting to hang out with your friends, you might be tempted to get a credit card. Beware, things are not what they seem! Credit cards seem super cool. 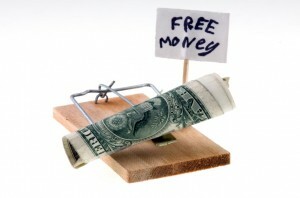 The concept of free money and then low monthly payments is hugely appealing. However, your parents probably taught you something right, if it sounds too good to be true, it is! While credit card companies are no longer welcome on campus for recruiting purposes, there are people out there setting up bogus booths to steal your information. It might seem far-fetched, but identity theft needs to be a real concern. Over 30% of identity thefts are against people under 30! That’s you! Don’t let them take advantage of your trusting nature. Learn how to protect yourself. Some identity thieves are garbage pickers. Yes, they will dumpster dive for those trash-bound credit card applications. Some companies send you pre-activated plastic just hoping you’ll call the number on the back. However, if you throw that card away you are letting a potential wannabe assume your credit and destroy your score. If they are able to gain access to your accounts via old bills or other means, it’s imperative that you become proactive. Don’t just glance at your bills, take the time to go over them line by line. Thieves will take small amounts at a time so that they have access for extended periods. As if credit card scammers and identity thieves don’t give you enough to consider when trying to balance a precariously miniscule budget, there are other things to be on the lookout for. These individuals are only after one thing, your money! Free money in the form of grants and scholarships are every college student’s dream. Certainly most who attend college applied for at least one, if not several of these options. So, it’s only natural when a letter offering you a large sum arrives in your mailbox, it’s got your attention. If this letter asks you to provide personal information as well as an application fee, don’t do it. There are people out there creating fictitious grant and scholarship letters and forms targeting you! Once they have your application fee, they’re on to the next victim. It’s a good rule of thumb to avoid all odd check depositing requests. There are people who will take advantage of your roommate needed ads. They’ll send you a check to hold their position and then request you return whatever amount isn’t needed. You’ll soon discover their check was worthless while yours gets cashed. If anyone approaches you wanting to split a check with you, run screaming. They are also trying to take you for a ride on the lose-your-money train. Don’t respond to any crazy out-of-the-country emails about check cashing either! It’s common knowledge that college kids like music and movies. People generally expect that at some point a college student is going to pirate some of either or both. That knowledge provokes thieves to send you official looking documents warning you that you’ve been caught pirating. They threaten you with jail time and fines. The catch is that if you’ll send them a payment then you can settle the dispute without further hassle. Even if you’ve illegally copied the latest Miley Cyrus CD, or Lady Gaga album, or dare we say it, Justin Bieber, chances are no one knows! Don’t send anyone any money without doing some serious research to validate their claims and existence first. Keep your checks for groceries and rent. If you do become the unfortunate victim of a scammer, do your part. Help keep other people from following in your footsteps. There are several agencies who dedicate all their energies to fraud prevention. Let them know about the scam you’ve encountered. If you’ve encountered credit card scams, contact eConsumerServices. They are a consumer protection agency that helps cardholders get their money back after credit card scams. Complaints against a specific business should be directed to the Better Business Bureau. The BBB acts as a mediator, but they don’t handle criminal litigation. While the Federal Trade Commission won’t be able to handle individual cases, they will compile the information to help prevent widespread scams and criminal activity. Another organization that would be interested in learning about your scam is the Internet Crime Complaint Center. The IC3 is a joint effort with the FBI, Bureau of Justice Assistance and the National White Collar Crime Center. Financing your college education is challenging enough. Don’t make the process more difficult than it needs to be—stay away from scams! Don’t let a credit card scam turn you into a victim. Lots of scams are based around securing your personal information. This occurs routinely with scams like identity theft, but can also happen in scholarship searches. While financial aid information such as your FAFSA pin number and social security number may be required for your FAFSA forms, it should never be required to apply for scholarships. FAFSA stands for Free Application for Federal Student Aid. If you’re confused, their customer service team is there to walk you through any and all questions you may have. Many groups and programs will offer to fill out your FAFSA for you for a fee. While there are some scholarship organizations that legitimately aim to help students get their FAFSA filled out or locate scholarships—and may charge some fees—they should have enough information available to help you make an informed decision (such as a physical address and other contact information, and ideally a proven track record or history with third-party reporting or review companies). Avoid working with a company or scholarship search organization when red flags, including sales pitches and pressure, are present. The New York Times also cautions students and parents to make sure they are on the right website when filling out the FAFSA. Parents and students should fill out their FAFSA on FAFSA.ed.gov. According to CollegeBoard.org, you may be encountering a scholarship scam if the organization promises or guarantees you a scholarship, or if you receive unsolicited emails informing you that you’ve been selected to receive a scholarship. Scholarships are great ways for students to get “free” money for school, but they must be earned through applications and, often, essays and other projects. Be wary of spam emails telling you that you’ve won money for school or guaranteeing you a scholarship. There are a limited number of people, organizations, and websites that you should trust when you are going through this process. The Federal Student Aid Office of the United States Department of Justice has plenty of information on reputable organizations. You can also do a bit of background research on your own. According to US News and World Report, you should never trust a scholarship offer if there is no clear history of past winners, no phone number, or if the scholarship organization claims to “do all the work for you.” Legitimate scholarship organizations or search services will present a student with a number of scholarships that the student is eligible for (sometimes even for a small fee), but will not do the work for the student. Scott Weingold, in his report with The Huffington Post, warns students to try to reach out to officials whenever possible. Weingold offers an example of spam emails telling students there was an issue with their FAFSA. If you receive an email like this, do not respond to the email—instead, revisit your FAFSA or contact someone from the Department of Education. Likewise, any issues with your scholarship information should be handled with the organization itself, not a third-party. Applying for financial aid and scholarships doesn’t need to be an overly stressful time. It should be exciting; after all, it’s the start of the next big journey in your life. However, to avoid falling for a scholarship scam, make sure that you are level-headed, informed, and never give out personal information to those who don’t need it. This article was contributed with inputs from Jodelyn Guerrero, a career expert who hopes to help you get started with the first steps to start your career. She recommends taking a look at the finance jobs with moneyjobs.com if you’re interested in a finance position after graduating. Be Smart About Your Money – Be Smart Online! This election season the number one concern was money. Are there enough jobs, do they pay enough to live on, will we be better off next year than this year? We are all concerned about money and how to manage it the best. We worry about whether our kids know enough. Being smart about money also means being smart online. You can have a great budget and be a good saver, but can lose the whole thing online to one scam from an identity thief. We are all pretty smart as we go out and about on the streets. It’s when we sit down at our computer that we start to forget. We may read in the paper about a con that targeted senior citizens or someone else. Usually the thought process we all go through includes “I wouldn’t fall for that.” But would you? The number one place that con artists live is on the internet. Far too many fall for it. People steal your money on the internet – and they don’t do it by hacking your bank account. They do it by finding information about you to steal your identity. Much of it has been given without realizing it – even on purpose! Your email is full or needs ‘renewed’. To fix the problem, you are to reply or go to a web form and provide information. This usually includes your username and password. Your bank is conducting a routine verification and also needs your information. The schemes may talk about your social media account (“someone friended you!”) or even warn that someone is trying to steal your identity. They also come in forms that play to our need for money. An offer to work from home is the one that catches the most. Someone brought one to me recently about a UK company contacting their son, who was away at college, to work for them. They needed him to order supplies for them. They would tell him what to order and where to ship it. This seems innocent enough, but I had to ask why? Why contact a college student in the Midwest to order supplies and ship them to the company? Staples can ship anywhere with a credit card. This violates one of my top (online) rules – if the offer sounds too good to be true, it is. The catch here was that they were to cash the check and then send the money to the supplier via Western Union. The check would have bounced, leaving the student out the cash. The other one that hits this are offers of free stuff. I am particularly wary of all surveys, but any that come uninvited are especially suspicious. A better way to approach all of these may be from a video I found on the subject. The video was part of a competition for awareness about cyber scams. If someone approached you on the street with an offer like the one on your screen, would you give this stranger the information? The answer is probably no, so don’t do it online! My last thought on the subject is to not make it easy to for these people. You have a lot of the information they need already out there. On Facebook and other sites people routinely put their date of birth (year included), place of birth and other personal information. These pieces of information can be used by identity thieves to recreate the first 5 digits of your social security number. These sites are a place to hook up with your friends. They either already know or don’t care how old you are or where you were born. If you think it can’t happen to you, read this story about a tech editor who lost his whole online life – including every photo of his new daughter – because of an identity thief. 2. If it sounds too good to be – it probably is! 4. Verify! If you are concerned about a notice. Pick up the phone and call the bank or other. Use the number from your statement, card or something other than the email you just received. 5. A little education doesn’t hurt. Learn to read links. 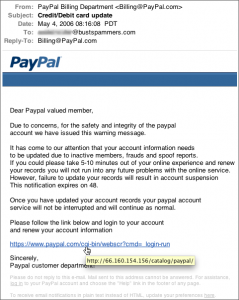 Phishing scams will often scare people into clicking a link that looks real, but isn’t. You can tell if a link is real before you click (see the picture above). Microsoft also has a good summary with examples. And be safe out there. Get smart on Phishing! Learn to read links! A good anti-virus and security system will protect you from viruses and spyware that could intercept your personal information from within your computer or over shared WiFi networks that are common in campus settings. Once you have installed this protective software, it is good practice to run regular security scan updates on your computer each day. As tedious as it may sound, it is important to thoroughly comb over your monthly bank statements and look for suspicious activity. The sooner you catch a probable security breach, the less long-term damage you will feel. If you do see something out of the ordinary, contact your bank immediately. Mobile banking is a quick and convenient way to regularly track your account activity on-the-go. Social media may be a community based on sharing, but sharing too much can give identity thefts just the tidbit of information they need—an address, an email, your banks name, your mother’s maiden name—to access your personal information. You can never be too careful. If you think something you’re about to post could be valuable to an identity thief, don’t share it. Every credit card holder should enroll in some type of Identity Theft Protection Service, which monitors your card activity for suspicious transactions or account activity. You can also sign up for alerts with your bank provider, so that you will receive instant notifications directly in your email inbox or on your smartphone. Schools often send your important documents—like academic records or tuition payment information—through standard mail delivery services, but school mail boxes are not always. If a paperless, online option is not available (e.g. online bank statements), arrange for any mail containing sensitive material to be sent to a secure, trusted location, like your parent’s house or a post office box. Keep all important documents—Social Security card, passport, medical files, bank statements—in a secure lock box. Instead of throwing away old credit card bills and other financial statements containing confidential data, shred any paper documents that you don’t want someone else getting a hold of. Identity thieves are always thinking of creative ways to scam the unsuspecting college student and get their hands on your personal information. One popular scheme is called phishing, in which thieves pose as a bank or credit card company and ask for your confidential financial information, usually via email. Banks, in almost every case, will not ask for your personal information over email, Twitter, text message etc. If it is indeed your financial service provider, they should already have this information on record. Con artists try to find angles in any and every niche possible. Sadly, one of those niches is scholarships, and the scams can sometimes detract from the truly outstanding and helpful scholarships that are available to students of all ages. Here are some ways to spot a scholarship scam. Specific requirements must always be met in order to obtain a scholarship of any kind. A certain grade point average is usually a prerequisite, and then other qualifying factors are taken into account, like gender or ethnicity. But none of those factors should be the payment of any kind of fee, not even an application fee. Don’t be fooled by very low fees of just a few dollars, either. A scammer won’t necessarily charge a huge amount—that can get them caught more quickly. By charging just two or three dollars per application, they can still make a lot of money because more people will apply if the fee isn’t prohibitive. Do your homework and find the many free scholarships available. Many scholarships require students to perform some sort of task in order to win them. It may be writing an essay, passing a test, participating in an academic competition, or just pursuing a particular course of study. Legitimate scholarship programs require the students to perform the work themselves in order to be eligible. If you run across a program offering to write that essay, or so whatever else is necessary for a particular scholarship, it should be a red flag. Allowing someone else to do the work could get you or your child disqualified, not to mention, this work won’t be performed for free. There will usually be a fee of some sort involved. Don’t fall for it. As wonderful as it would be for someone to show up and simply hand you or your child a scholarship to a great program or school, it just doesn’t happen that way. Scholarships must be applied for, or are the result of contests that require actual entry. No scholarship magically materializes for anyone. If you receive any sort of correspondence saying you’ve won a scholarship and all you have to do is claim it, be wary. Information for legitimate scholarships is freely available, from schools, in educational publications, and on the Internet. There are no secret scholarships out there that are only made available to a select group of people, or, as you might guess, those who pay for the information. Any scholarship program that says the information they have is exclusive, and unavailable anywhere else, is running a scholarship scam. Save your money and stick with the free resources. If you’re still unsure of a scholarship offer you receive either via e-mail or regular mail, talk to a counselor at the educational institution you or your child attends. They will be able to look up the program that contacted you, and tell you whether it’s legitimate or not. Don’t be afraid to ask for help, or do a little research on your own. It can end up saving you a lot of money.